Pesto originally comes from Genoa in Northern Italy, but today is used in many different Italian dishes. including pasta, boiled potatoes, sliced beef, and even in minestrone soup. Pesto is made from basil, pine nuts, hard cheese (such as Parmigiano Reggiano), garlic, salt, and extra virgin olive oil. If you love basil, then this is the pesto sauce made for you! Prego sauces are made with sweet vine-ripened tomatoes and savory herbs and seasonings you can taste in every bite. Whether you’re in the mood for a zesty Italian tomato sauce or a rich, creamy Alfredo sauce—Prego brings irresistible taste your whole family will love. 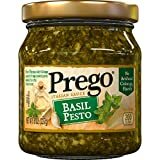 Prego Basil Pesto Sauce has all the great taste made from high-quality ingredients you expect in a pesto: basil, Romano cheese, extra virgin olive oil and sea salt without any added flavors or colors. Rich in flavor, add it to your favorite pasta dishes for a savory meal with the family anytime. Prego sauces are made with sweet vine-ripened tomatoes and savory herbs and seasonings you can taste in every bite. 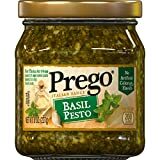 Whether you're in the mood for a zesty Italian tomato sauce or a rich, creamy Alfredo sauce—Prego brings irresistible taste your whole family will love. 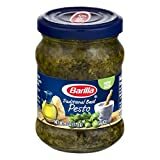 This is a pack of one 6-ounce glass jar of Barilla basil pesto sauce. It's perfect for use on your favorite type of pasta. From its humble beginnings in 1877 as a small shop and bakery in Parma, Italy, Barilla has grown and strived to become the internationally trusted brand of pastas, sauces and Italian entrees that it is today. Our mission is to help people live better by bringing well-being and the joy of eating into their everyday lives. Barilla values its customers and employees, and believes that a sense of belonging, courage, and intellectual curiosity inspire our company's behavior and characterize our people. Barilla has always linked its development to customers' wellbeing and to the communities in which it operates. The Italian food tradition of superior quality and simple recipes is alive and well with Barilla's line of Italian products. Let us transport you with our delicious and high quality pastas and sauces. 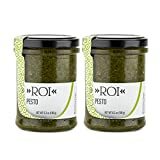 Ligurian Pesto (180 gr.) is an ancient Ligurian sauce made from basil, garlic and pine nuts and "Roi" extra virgin olive oil. Pasta al pesto is a classic summertime Italian recipe. It is originally from Genova in the Liguria region of northern Italy but is nowadays widespread throughout the country. ROI is especially known for their olive production, where the olive grove and the flavour of the olives are influenced by the surrounding Mediterranean woodland and chestnut trees, the sea and wild herbs. The olive mill is currently composed of the traditional mill with a granite millstone and two presses, as well as a newly designed mill with a continuous cycle and cold extraction. 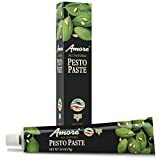 Ligurian Pesto (180 gr.) is an ancient Ligurian sauce made from basil, garlic and pine nuts and "Roi" extra virgin olive oil. Pasta al pesto is a classic summertime Italian recipe. It is originally from Genova in the Liguria region of northern Italy but is nowadays widespread throughout the country. 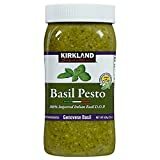 The name pesto comes from the Italian word pestare (to crush) traditionally the ingredients were blended using a marble mortar and a wooden pestle. The simplicity of this recipe requires the use of high quality tasty ingredients. Any pasta shape will work but traditionally trofie or linguine work best. ROI is especially known for their olive production, where the olive grove and the flavour of the olives are influenced by the surrounding Mediterranean woodland and chestnut trees, the sea and wild herbs. The olive mill is currently composed of the traditional mill with a granite millstone and two presses, as well as a newly designed mill with a continuous cycle and cold extraction. Taste Profile: salty, herbal, rich, cheesy, bright. Pairing: pasta, fish, soup. Try our Farfalle with Kale & Pine Nuts recipe! Filippo Berio Pesto, Classic Basil, is produced in Liguria, Italy, the original home of pesto! This classic is bursting with the flavor of fresh basil and includes Basil, Grana Padano cheese, cashews, Pecorino Romano cheese, pine nuts and Filippo Berio Extra Virgin Olive Oil as the main ingredients. 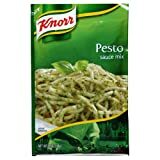 Popular recipes include: Farfalle with Kale & Pine Nuts, Chicken Soba Noodle Pesto Salad, Avocado & Pesto Grilled Cheese. This product includes a single 6.7-ounce glass bottle. For 150 years, Filippo Berio has honored our founder’s passion, artistry, and uncompromising commitment to excellence. Our products carry our founder and namesake’s signature as a guarantee of quality and authenticity. Our goal is to help cooking enthusiasts all over the world create their own signature recipes that are both flavorful and healthful. Filippo Berio - The First & Last Name In Olive Oil.